The latest happenings at Small Bites by Jessica, this week’s Link Love, and Menu Plan Monday! Happy Monday everyone! Hope you didn’t miss Menu Plan Monday too much last week – I was away with my family for President’s week! We enjoyed some sun and warmth in Grand Cayman, which has a beautiful beach and some amazing food. One of the best things about the menus on the island is that there is so much fish! We certainly had our fill of ceviche and tartares, not to mention lots of delicious fillets of fish, especially mahi mahi, which is common there. My daughters are a little fished out for the time being, but if you’re looking for a fish recipe, you have to try the Fish Tacos with Citrus Salsa I posted last week! Although citrus fruit is at it’s prime in the winter, these tacos will make you feel like you’re on an island yourself! Of course along with all that nutrient-rich fish, we had our fair share of desserts and ice cream, so this week’s menu is veggie-heavy so we can get back into routine. 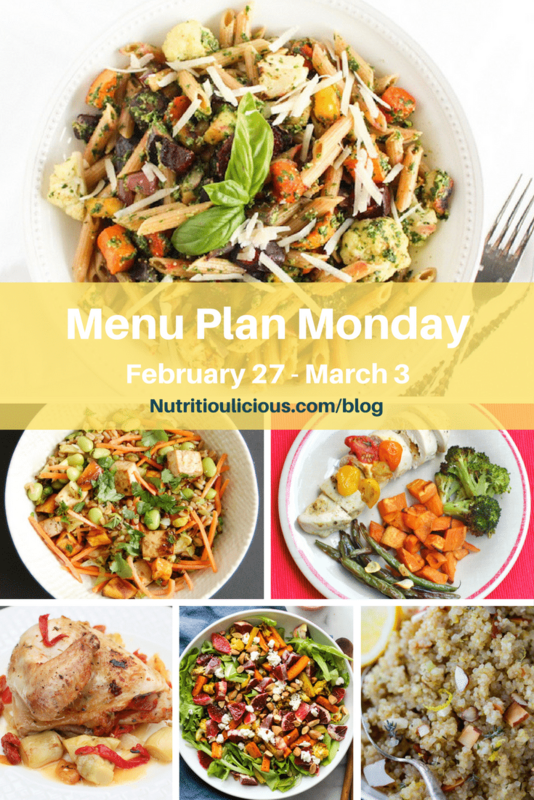 It’s a really delish menu if I say so myself, so be sure to check it out below! Before you do though, check out the articles and recipes I enjoyed from around the web over the past two weeks! ⇒ This is an incredibly thought-provoking and inspiring post. I am pretty sure most of you reading this can relate to the feeling of a never-ending to-do list and a feeling of busy-ness all the time. Taking the time to figure out what is most important in life is so important and puts everything else on the list in perspective. ⇒ There are so many versatile uses for coffee filters that they are worth stashing away in your cabinet even if you’re not a coffee drinker. ⇒ When so many social activities revolve around eating and drinking, it can be hard to maintain a healthy diet and lifestyle. Les shares some great tips to help – I especially like her tip to “focus on connections over confections.” You can check out some of my tips for handling weekends in my post 5 Tips to Stay On Track Over the Weekend. ⇒ I think you know how much I love making egg muffins – they’re so easy, versatile, and a hit with the kids. Love Jodi’s variation here using sweet potatoes. ⇒ I love how such a simple side dish can look so elegant! ⇒ It seems like we may be done with the snow for this year (although it has been known to snow in March in NY! ), but I’ll be holding onto this list for next winter! ⇒ This salad is packed with flavor and a great use for those blood oranges I have leftover from my Fish Tacos with Citrus Salsa! It’s actually on my menu this week (see below)! ⇒ I love how fun yet balanced these breakfast tacos are! ⇒ A perfect way to bulk up the canned soups you have lying around the pantry. Thanks so much for including my Apple Pie Breakfast Tacos! You’re most welcome Lauren! I can’t wait to try them!